From Arbois to Sud Revermont, Poligny, L’Étoile, Coteaux Lédoniens and Haute-Seille... Discover Jura Vineyard across almost 80km of extraordinary countryside, and meet friendly wine-growers who will arrange tastings of Jura’s 7 AOC wines: Crémant, Macvin, Côtes du Jura, Château‐Chalon, L’Etoile, Arbois and Marc du Jura. The landscape changes as you pass from the North to the South of the Vineyard, opening the door to surprising new discoveries. A true culinary delight, Jura’s cheeses are an authentic symbol of the region’s history and culture. Jura’s 3 AOC/AOP cheeses, Comté, Morbier and Bleu de Gex, offer varied aromas across the seasons, forever letting you experience new and delicious flavours. And don’t forget the famous Laughing Cow®, Cancoillotte, or Raclette and Mont d’Or which, along with Comté, are simply the best there is for convivial gatherings around a cheese fondue. 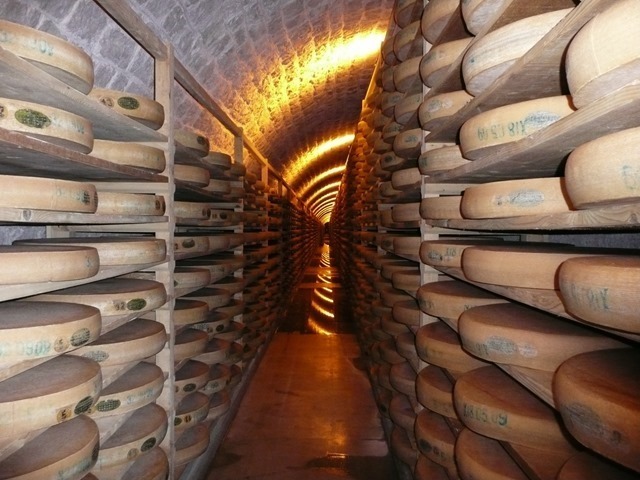 You can also visit many of the cheese factories and see how the cheese is made. Discover the Comté de Largillay cheese factory, just a few minutes away from Camping Beauregard. Jura, with its varied and generous local produce and its wide open spaces, will surely have something to tickle your tastebuds. This high-quality produce, made through the marriage of naturally fertile land with the age-old savoir-faire of local producers, will bring you the best of Jura. Here you’ll find the finest products that France has to offer: there’s Bresse chicken, Morteau sausage, Mont d’Or cheese, Pontarlier Anis, absinthe and other spirits, or cured meats. So go on, treat yourself!